We see out the week with a couple of busy days at Ballarat and Cranbourne with six runners representing Ballymore at those two meetings. Heading to chilly Ballarat on Thursday, we saddle up Lord Barrington in the City Of Ballarat Handicap and we are confident of a bold showing from the lightly raced and promising three-year-old who has not raced since the spring. "He trialled really well at Werribee recently," Michael Moroney reported, adding that the close relation of stable favourite Mr Baritone has indicated that he will be at home on a wet track. "He trialled well on soft going in New Zealand and it was also wet at Werribee so we are pretty sure that he will handle it." "He is nice and forward for this race and he should prove hard to beat." 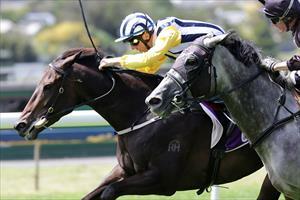 In the following race, the Hygain Showcase, we have stayer The Hotz stepping up to 2200m. "He just didn't have any luck last start," Moroney rued. "He is a free flowing horse who did not appreciate being held up behind the leaders and it best to forgive him that run." "There looks to be a bit more speed in this race than we wanted as we were hoping he could lead - but it should be a staying test and he is fit and well." Rising Stock is the first of our Cranbourne Friday night runners, the three-year-old due to take his place in the fourth heat of the Procon Mile Series. "He was really good last start," said Moroney, noting that "it was his first run over the mile and he had to be used up a bit - but he fought on very well." "He is still a preparation away strength wise but from a good gate he should not be far away." Our other three Cranbourne runners all contest the same race, the fourth heat of the Stayers Series. Unfortunately they have all drawn out a bit, especially Habitual Offender (pictured) who will jump from barrier 13. Stripping fitter for three runs back from a spell, the Guillotine four-year-old was, Moroney admits "a bit disappointing last start" - but he was on pace in a race run to suit the swoopers. "He is ready to do something up to this distance now and we think he can atone." Savvy Dancer meanwhile is having his third run in and is, says Moroney "probably still one run away coming back from a long break." "He can improve but he is better over even longer and he is still pretty burly." Out of the placings when fancied by the stable at Flemington last start, imported mare Court Pastoral is back to provincial class and she looks well placed - although she is yet to strike rain affected going. "That is the question mark with her but she strips fitter and is capable of improvement."